Trading standards officers have warned shoppers to beware after an investigation in south-east England found 91 shops selling illegal alcohol. Surrey County Council (SCC) said 26% of 347 shops tested in 19 local authority areas were selling fake goods or stock on which duty had not been paid. Counterfeit vodka containing high levels of methanol and fake champagne were among the examples. The four-month inquiry was carried out with HM Revenue and Customs. 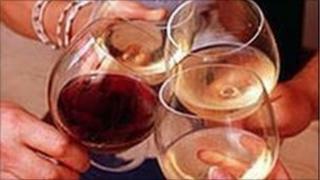 It took place earlier this year and discovered fake beers, wines and spirits on sale. Fictional champagne brands Donmonay and Raymond Vadim found during the investigation actually contained sparkling wine. SCC said high levels of methanol found in fake vodka could cause nausea, vomiting and, in extreme cases, blindness or even death. Councillor Kay Hammond said: "Fake brands of alcohol can contain potentially lethal amounts of methanol because they have not been through the same quality controls as the real thing. "People may be tempted by the cheap price of fake alcohol at Christmas, especially during these difficult financial times, but I would urge them not to gamble with their health." SCC said trading standards had begun prosecution proceedings against all shops and off licences found selling counterfeit alcohol in the county but could not sure be it had uncovered all stocks. Steve Ruddy, from SCC Trading Standards, urged shop owners approached by dubious suppliers to report them. "We will take action where we can to clamp down on this to protect local people, but also to protect local businesses and the reputable suppliers who also suffer as a result of this illegal trade," he said.